ICA Spa – leader since 1963 in the design, development and production of packaging machines from flexible materials and of complete lines for hot beverages single serve capsules, API Spa, a long-standing company with a wealth of experience in the soft thermoplastic compounds field and leader of the biopolymer industry, SACMI – international group that leads the world in machines for packaging including Beverage and Closures&Containers, Together have designed and developed a 100% biodegradable and compostable single serve capsule for hot beverages. 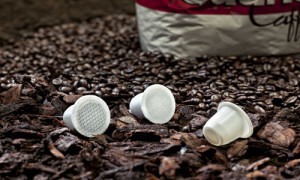 Presented for the first time at INTERPACK 2014 at the ICA stand, the 100% biodegradable, compostable capsule proved to be a big hit, arousing considerable levels of interest and curiosity. The cap-making compression technology, for which SACMI is so renowned, has been able to take full advantage of the unique rheology and behaviour of the molten material, APINAT BIO.Besides, the flexibility of this technology hasresulted in optimising the APINAT BIO compound reaching an outstanding production output (up to 600 capsules/minute in a CCM 24 cavity machine) and maintaining the functional, biodegradable and compostable performance of the capsule.